"Sampath Speaking" - the thoughts of an Insurer from Thiruvallikkeni: Crisp factory fire in Newport, South Wales - Arson - man sentenced.. Crisp factory fire in Newport, South Wales - Arson - man sentenced..
Life in General Insurance is replete with terminologies – risk, hazards, perils and more…… ~ and ‘fire’ is a primary peril … which we have heard of, perhaps seen – if not naked fire, the devastation caused by fire – have been dealt with … indemnifications made – payments under insurance contracts effected in time, making customers happy – more importantly – providing the much needed financial support to get back in business. In property Insurance – fire is an insured peril – there is the Standard Fire and Special Perils policy … of which the primary risk covered is the one caused by Fire which is long held that ‘there has to be flames and not mere scorching or seething heat’ and further defined to exclude destruction or damage caused by the property insured undergoing own fermentation natural heating or spontaneous combustion; that the subject matter of insurance is not undergoing any heating or drying process and the burning of insured is not by order of any Public Authority. The cause of fire is important – it has to be accidental in nature and not a fire caused by any of excluded perils. That the policy extends to cover strangely perils caused by wind, water, impact damage, aircraft damage and more is not the theme of this post. Experience could tell that most fires are reported to be ‘of electrical short-circuiting’ and a small percentage accidental fire, probably caused by bidi-smoking or somebody throwing unextinguished cigarette bud !! The newspaper report states that it was - Crisp factory worker Colin Goulding, 31, who started the blaze by having a sneaky cigarette; the man went into a storeroom to have a crafty cigarette accidentally started a huge fire which caused a £25million blaze and cost 100 of his colleagues their jobs. Now Colin Goulding, 31, has been sentenced for over six years for starting the blaze which was described by a judge as the 'most expensive arson' he had ever seen. 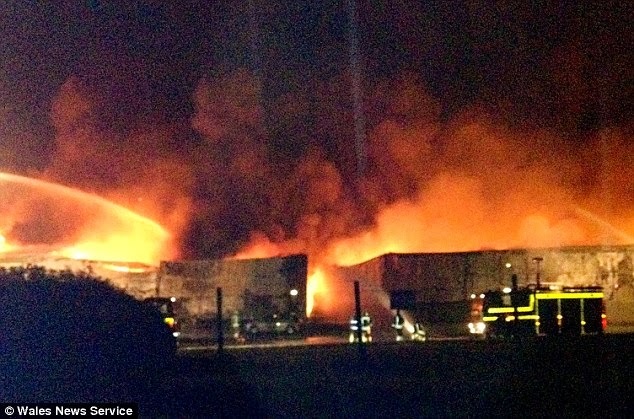 The court heard it took 65 firefighters to put out the blaze at the Real Crisp factory in Crumlin, near Newport, South Wales. The negligent throwing resulted in loss of jobs as also huge loss of property. The man reportedly was working on a night shift on a production line boxing packets of crisps when he sneaked off for a cigarette at 3am, the court heard. Prosecutor Matthew Roberts said: 'He admits breaking the healthy and safety codes and company policy. 'The reason these rules are in place is because one is dealing with extremely flammable material in an extremely volatile environment. 'He had no legitimate reason to enter the goods warehouse - all he needed for his work was within arms reach of his packaging station. 'But he left to have a cigarette, walked into the goods warehouse and lit it. He moved into the storage area when he thought someone was behind him so he discarded it. 'The seat of the fire was in the packaging area, it’s obvious to anyone that discarding a lit cigarette in this area carried a risk to life and property. 'The fire started easilly and spread quickly causing irreversible damage to virtually all of the factory. The damage was so extensive that the factory burnt to the ground and was entirely demolished. The factory made Irish crisp Taytos, British supermarket own brands and crisps for international buyers. 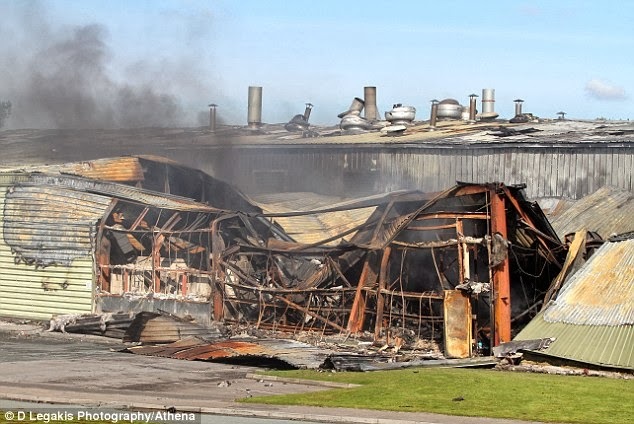 The court heard that at the time of the blaze on September 20, 2012, there were 40 tons of potatoes and 60,000 litres of cooking oil on the site. The court heard Goulding, who is of low intelligence, had no idea his cigarette started the fire. He filmed the blaze on his camera phone - as his colleagues rushed to escape - before calling 999. Goulding of Abertillery, South Wales, admitted arson being reckless as to whether life was endangered. The owner of the factory chose not to rebuild it and everyone working over there lost their jobs. Judge Richards stated that it was a wholly reckless act and concluded that it was the most serious arson that he ever contended with. For the act causing damage and loss of jobs to others, the man was given a total of six-and-a-quarter years behind bars. In the court, Colin William Goulding aged 30 from Abertillery, Blaenau Gwent pleaded guilty to Arson with intent to endanger life at Cardiff Crown Court on Tuesday 7th January 2014. The Fire crew stated that due to their expertise and the quick evacuation of the staff working at the factory no injuries were incurred. Following the extinguishing of the fire a joint investigation into the cause of the fire was conducted by South Wales Fire and Rescue Service and Gwent Police. The evidence gathered by both Services and the subsequent reports proved beyond all reasonable doubt that Colin William Goulding was guilty which led to his guilty plea. The Head of the Fire Crime Unit is quoted as stating : “Currently 78% of all fires attended by South Wales Fire and Rescue Service are started deliberately which is completely unacceptable. Arson is a serious crime that has an impact on the whole community. The South Wales Fire and Rescue Service Fire Crime Unit will continue to work with the Police and its partners to bring arsonists to justice. We also urge members of the public to help us look after their communities and the safety of their families by reporting any individuals they believe are involved with arson activities. Vastly reproduced from Daily Mail Co Uk.